Anterior reclinate orbital seta opposite or above proclinate one, distinctly shorter than the other 2 orbital setae; posterior reclinate orbital seta closer to proclinate orbital, than to medial vertical seta; postocellar seta well-developed; antenna not porrect; two or more ventral branches on arista; gena often broad; mesonotum usually with 6 or more rows of acrostichal setulae, and 2 pairs of dorsocentral setae; usually two pairs of postpronotal setae; prescutellar seta absent; sterno index usually 0.5 or more; costa reaching apex of vein M, cells bm and dm confluent; dark posterior bands on abdomen usually narrowed or interrupted in mid-dorsal line (except in subgenus Sophophora); posterior Malpighian tubules forming s closed loop around gut, their distal ends sometimes merely adjoined, but usually fused and with a continuous lumen; surstylus with a row of prensisetae; testes long, spiralled; oviscapt valve sclerotised, conspicuous, and with numerous, distinct ovisensilla; ventral receptacle long, fine, usually coiled; usually two to four egg-filaments, at least anterior ones tapering; anterior spiracles often more than 1/6 length of puparium. - Bächli, G., Vilela, C.R., Escher, S.A. & Saura, A. (2004). 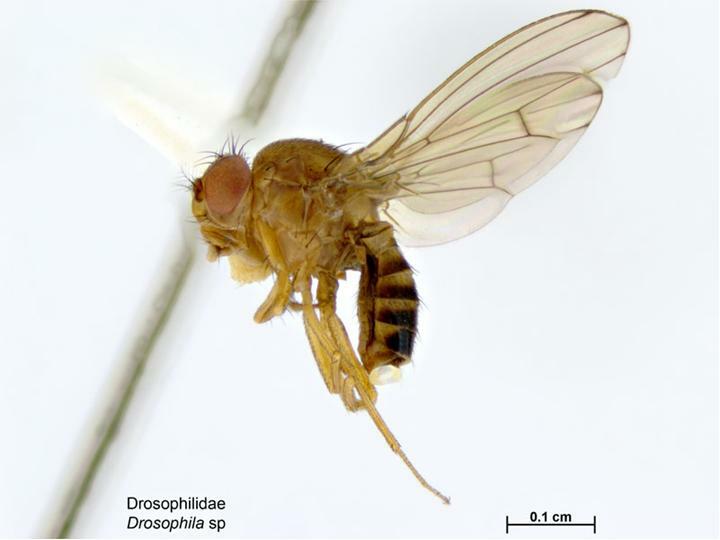 The Drosophilidae (Diptera) of Fennoscandia and Denmark. Fauna Entomologica Scandinavica, v. 39. Leiden, Brill, 362 pp. MAF Plant Health & Environment Laboratory (2011) Pomace Fly (Drosophila sp.) Updated on 3/23/2014 10:51:46 PM Available online: PaDIL - http://www.padil.gov.au.